RACETIMER is an application designed and tested for the circuit races. The APP allows you to record lap times without any interaction: just press the Start button and when the first movement occurs, the stopwatch starts, recording the starting position. 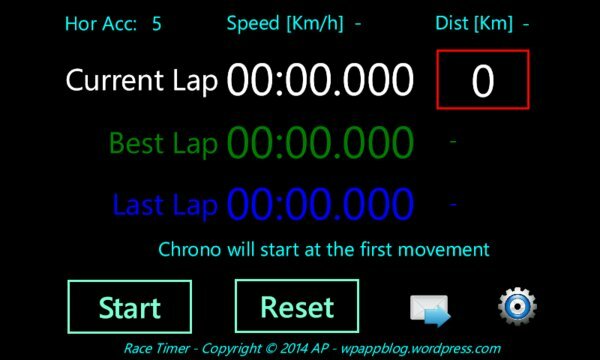 As you made a lap, you return to the starting position and the stopwatch start again for a new lap time, without having to press any buttons or you have to use external devices to connect to your smartphone. Besides you can customize the colors to live the best experience and to send the times table to you e-mail account. In the settings you can configure the level of accuracy for detecting the distance and speed. In fact, all the internal GPS for smartphones suffer from a problem related to the accuracy of the signal: in case of bad signal strength, the accuracy of the measurement is not good. You can also set the number of laps to go, the circuit length (measured by the distance traveled), a delay starting time (a safety option in case of sudden movements) and other useful settings. The screen is locked to Landscape Right orientation.